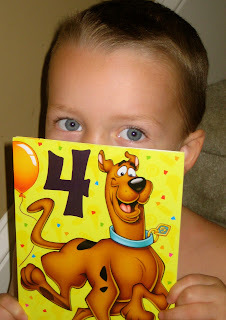 Raising Jack With Celiac : Jack Turns 4! Happy 4th Birthday Buddy! WOW, are you really 4 yrs. old?? You are getting so big and growing up so fast! Jack LOVES Scooby and Spider-man so we had to celebrate with these two fellows in mind! Two years ago, just after your 2nd birthday, we found out you had celiac disease. We were clueless, lost and confused. Celiac disease?? What's that? Well, 2 years later, you are healthy and taking the gluten-free lifestyle by storm! We've seen a lot change over the past 2 years. Manufacturers, restaurants, and others are understanding the importance of providing gluten-free options for their customers. The growing number of individuals with celiac disease or gluten sensitivity is astounding. Over 3 million people have celiac disease, which does not include those who have gluten sensitivity. Gluten sensitivity are those individuals who have tested negative for celiac, but are unable to tolerate gluten. In the past 2 years, raising awareness has been a passion of mine. Seeing people feel better and finding out what's really causing their pain and discomfort has been inspired by you Jack. Seeing what a gluten-free diet has done for you, only makes sense to share your story with others. God has a plan for you Jack, and your story has only just begun! Happy Birthday Scooby, I mean, Jack!